Buy Lavera basis cleansing gel 125ml in the UK from our online shop or directly from our independent Scottish store. Lavera cleansing gel with organic lemon balm and organic mallow. Lavera Organic Cleansing Gel from the Basis Sensitive range is an every day facial cleanser for the whole family, allowing your skin to breathe by effectively and gently removing dirt and excess oils that have accumulated during the day. The cleansing gel contains natural and organic gentle cleansing ingredients with additional moisturising ingredients, so you don't get that dry tight feeling on your skin after cleansing. Organic Lemon Balm refreshes and revives your skin after cleansing. Organic Mallow extract soothes irritated skin and leaves it looking healthy. As official Lavera stockist, we sell genuine Facial Cleansers directly from our shop in Scotland and online throughout the UK. Where can you buy real Cleansing Gel safely online? If you are wondering where you can buy Lavera basis cleansing gel 125ml safely online in the UK, then shop with us. We are an actual health foods shop; with real people selling real foods and products. Our award-winning independent shop is located in Stirling, Scotland since 1976. You can buy our Natural cosmetics and organic skincare and other genuine Facial Cleansers in store or safely place an order with us online or over the phone. 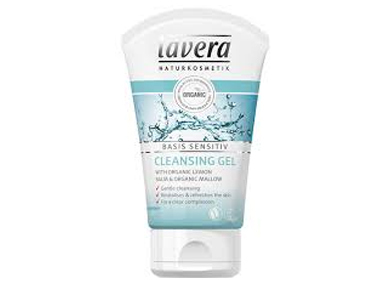 Cleansing Gel - Lavera basis cleansing gel 125ml in Facial Cleansers and Facial Care.